Designed in the late thirties this car did not roll into regular production because of the shift in industry toward military production. The 39 version was sold in limited numbers, of course more in the United States and can be differentiated from the 1940 version because its smaller grill. 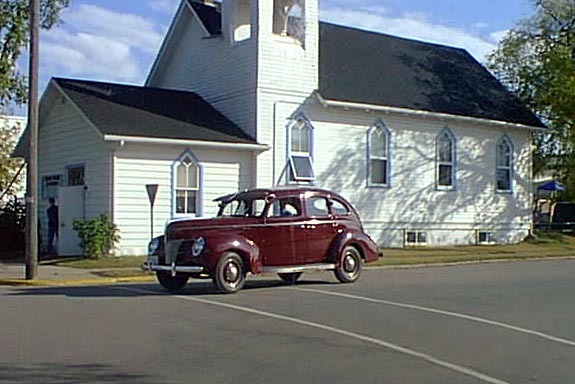 However, when Ford returned to regular production as it shifted from military production the 40 version was the design that rolled off production lines after the war ended though there are subtle differences the vehicle could have a production year of 1940 to 1945 the tail lights are the telling feature. ( The 1944 version actually had sargeant strip tail lights.) With an eighty or so horse power "L" head V8 the very light car was actually over powered. The vehicle's "600-16" tires raised its centre of gravity well above the earlier definitive Ford of the thirties, the suicide doored 34 and 36 version with its metal spook wheels, same engine and much lower profile. The high centre of gravity on this vehicle made it a vehicle that could not tolerate rapid changes in direction. Other then that serious flaw, the vehicle was superbly built and extraordinarily roomy. The back seat in a 40 Ford was as big as many modern mini-vans. Because of the vehicles axle gear ratio, the vehicle had absolutely neck snapping acceleration and a top speed of about eight-five miles an hour. This immaculate version was spotted on the street in Melfort Tuesday in an unusual peace time maroon colour. The standard colour for a 40 Ford was OD green (Olive Drab) although there were black ones, Ford kept its range of colour extremely limited after the war. Though it is possible that this is an original colour, it is much more likely to have been changed to this colour in the fifties Mercury sported a colour similar to this in its 1948 model. Though there were a fair number of these made, if you watch close in movies made during World War II you will see staff cars, usually 39 versions in most movies including a white coupe convertible in "From Here to Eternity". There are few left in existance now as they were shunned when Ford introduced the monocoup modern design in 1948 of the 1949 version. It had a slightly more powerful engine but was a much lower profile and with a different gear ratio could easily top 100mph. The old fashioned looking 40 design with its running boards and non-integrated fenders sold at low prices as used cars and vanished in a few years. In 1950 a low mileage 1944 Ford sold for $900.